Integrating games into academic lessons ignites the fun factor, makes instruction multisensory and grabs the attention of even the most discouraged learners. I, too, enjoy the creative process and love pulling out my craft and scrapbook materials, so the new game of the week brings excitement and wonder into the classroom. This week, I created the Fun House Money Game to help students develop their skills identifying and adding pennies, nickels, dimes and quarters. 1) Remove the bottom of the box with scissors. 2) Cover the box with colorful craft paper. 3) Cut four doorways/holes in the side as illustrated. 4) Label the doorways: pennies, nickels, dimes and quarters. You can also use this same game for fractions, or other numerical denominations. Place the colorful box at the end of a table or melamine shelf. Then, give each player twelve marbles or shuffle board pieces. Next, decide who goes first, and take turns trying to get the marbles/shuffle board pieces into the doorways of the box. When a marble enters the box, have that player select the correct change from the change basket. 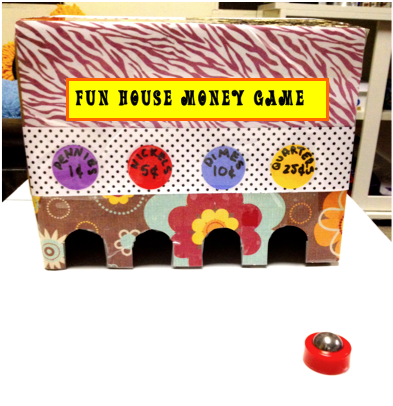 Once one of the players has rolled all their marbles into the box the game is over and all the players add up their change. The winner is the player with the highest total. I hope you enjoy this idea! I would love to hear your thoughts! !